After becoming Governor General of Pakistan Jinnah maintained his citizenship of India. Just FYI. He was planning on going home and retiring in Bombay. The evidence for this claim is supposed to be Jinnah Papers, Volume IV, page 142. Let us systematically examine the two parts of this claim. 2. What is in the Jinnah Papers. Jinnah may have at some occasion expressed a wish to retire to Bombay, but evidence cited above does not say anything about it. And "maintained his citizenship of India" has no meaning. It also contradicts what he said on March 30, 1946 in his interview in Delhi by Norman Cliff, Foreign Editor, News Chronicle (of London). (3)Save as otherwise expressly provided in this Act, the law of British India and of the several parts thereof existing immediately before the appointed day shall, so far as applicable and with the necessary adaptations, continue as the law of each of the new Dominions and the several parts thereof until other provision is made by laws of the Legislature of the Dominion in question or by any other Legislature or other authority having power in that behalf. Accordingly we are told, (e.g., by Wiki) that all the people of India (and presumably Pakistan) "Indians resident, born and naturalised in Indian provinces legally remained British subjects, ...unless they had already acquired citizenship of the United Kingdom or any other country". Further, "The rulers and Indian subjects of princely states which had acceded to the Dominion of India or to the Dominion of Pakistan on or prior to 15 August (termed "Acceding States") became British subjects." Lastly, "Indians resident in a princely state which had not acceded to either Dominion by 15 August became temporarily stateless, lacking any recognized nationality or British subject status, though remaining subjects of their state." "From 1 January 1949, when the British Nationality Act 1948 came into force, to 25 January 1950, Indians in the Indian provinces became British subjects with Indian citizenship." The beginning of a definition of Indian citizenship not based on British legislation began from November 26, 1949. Pakistan first defined its citizenship only in 1951 (The Pakistan Citizenship Act that came into effect April 13, 1951). Thus there was no meaning, during Jinnah's lifetime, of "retaining his Indian citizenship" because such a thing did not exist. Jinnah died September 11, 1948, Governor-General of Pakistan to be sure, but if one wants to be nitpicky, legally still a subject of the British. 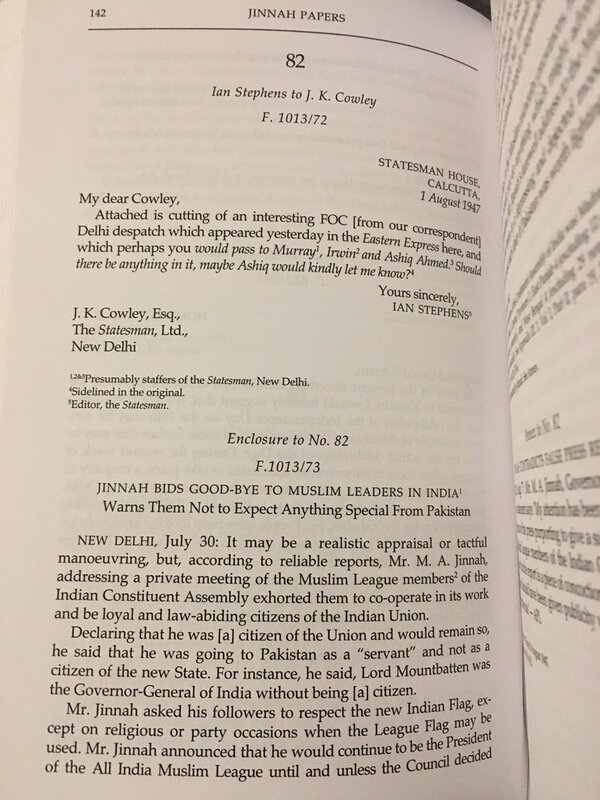 The short story is that there was a report in the press that Jinnah told a private meeting of the Muslim League members of the Indian Constituent Assembly that he was a citizen of the Union, that he was going to Pakistan as a servant and not a citizen, analogous to Lord Mountbatten being the Governor-General of India without being a citizen. Jinnah issued a statement that the report "is a piece of concoction" and "purely misleading and mischievous". 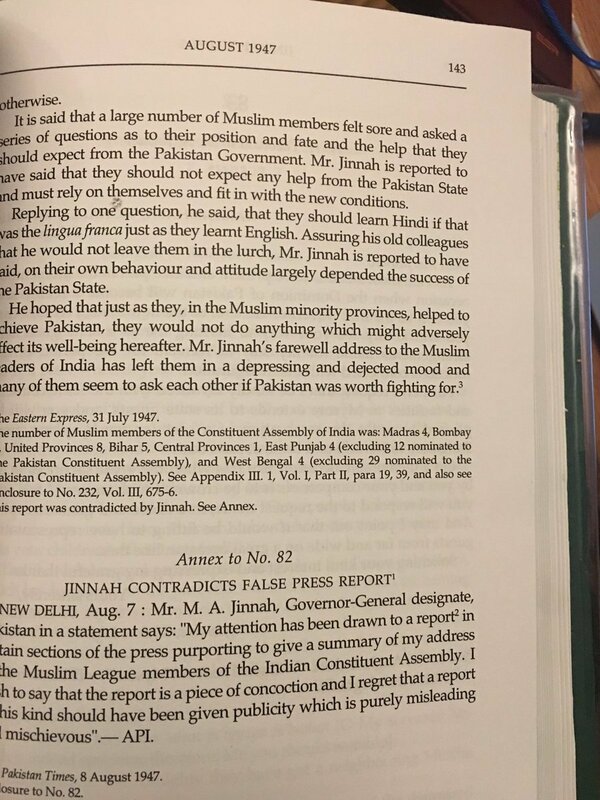 "JINNAH CONTRADICTS FALSE PRESS REPORT" appears on page 143 as part of the same main item (#82) that appears on page 142. The text of that #82 will be reproduced below, for the sake of readability and for search engines, followed by cellphone images of pages. The footnotes will be put inline, in smaller print, rather than at the bottom of the page. ,  & : Presumably staffers of the Statesman, New Delhi. NEW DELHI, July 30: It may be a realistic appraisal or tactical manoeuvring, but, according to reliable reports, Mr. M. A. Jinnah, addressing a private meeting of the Muslim League members of the Indian Constituent Assembly exhorted them to co-operate in its work and be loyal and law-abiding citizens of the Indian Union. The number of Muslim members of the Constituent Assembly of India was Madras 4, Bombay 2, United Provinces 8, Bihar 5, Central Provinces 1, East Punjab 4 (excluding 12 nominated to the Pakistan Constituent Assembly), and West Bengal 4 (excluding 29 nominated to the Pakistan Constituent Assembly. See Appendix III.1, Vol. 1, Part II, para 19, 39, and also see Enclosure to No. 232, Vol. III, 675-76. Declaring that he was [a] citizen of the Union and would remain so, he said that he was going to Pakistan as a "servant" and not as a citizen of the new State. For instance, he said, Lord Mountbatten was the Governor-General of India without being [a] citizen. Mr. Jinnah asked his followers to respect the new Indian Flag, except on religious or party occasions when the League Flag may be used. Mr. Jinnah announced that he would continue to be the President of the All India Muslim League until and unless the Council decided otherwise. Replying to one question, he said, that they should learn Hindi if that was the lingua franca just as they learnt English. Assuring his old colleagues that he would not leave them in the lurch, Mr. Jinnah is reported to have said, on their own behaviour and attitude largely depended the success of the Pakistan State. He hoped that just as they, in the Muslim minority provinces, helped to achieve Pakistan, they would not do anything which might adversely affect its well-being hereafter. Mr. Jinnah's farewell address to the Muslim leaders of India has left them in a depressing and dejected mood and many of them seem to ask each other if Pakistan was worth fighting for. This report was contradicted by Jinnah. See Annex. NEW DELHI, Aug 7: Mr M. A. Jinnah, Governor-General designate, Pakistan in a statement says: "My attention has been drawn to a report in certain sections of the press purporting to give a summary of my address to the Muslim League of the Indian Constituent Assembly.